The iconic Coexist bumper sticker has been brought to 3D form and combined with the energies of Amethyst in this novelty charm bracelet. 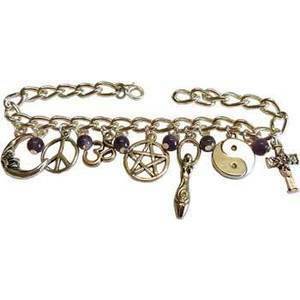 A waning crescent moon, the peace sign, an Om, a pentacle, the goddess, a yin yang, and a cross have been placed on this charm bracelet spelling "Coexist" while small Amethyst beads create space between the charms. This silver plated steel bracelet has a lobster claw clasp and is approximately 8 and 1/2 inches in length. This item was crafted in the USA.